South Africa became the third nation to play Test cricket, when they faced off against England in March 1889. Although they lost their first few series, they became a force to reckon with pretty quickly in world cricket. However, they were forced into exile for a little more than two decades (1970-1991) due to the apartheid rules of their government which led to ICC suspending their Test status. Despite missing out on the action for so long, South Africa came back strongly and till date, have remained one of the strongest teams. Strong teams are built on the backs of exceptional players and there have been several of those for South Africa. So, let’s take a look at the top 10 cricketers from South Africa who made their marks in the cricketing world. Mark Boucher is the most successful wicket-keeper to have played the game, at least in terms of statistics. He has effected a staggering 999 dismissals in international cricket. As a batsman, Boucher lived for the big moments, and he relished scoring the quick 30 or 40 runs his team needed to win a match and batting out an entire session to salvage a draw. He scored over 10,000 international runs (5515 in 147 Tests, 4686 in 295 ODIs and 268 in 25 T20Is). His most memorable innings was probably the scintillating unbeaten 50 he scored to complete South Africa's surge to a series-clinching target of 438 in a one-day international against Australia in Johannesburg in March 2006. 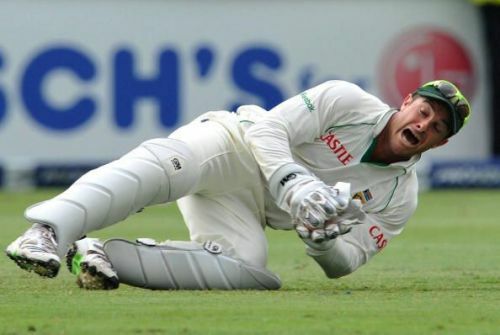 Boucher’s 15-year career ended in a rather unfortunate way when he was hit in the eye by a bail during a tour match in 2012 which forced him to draw the curtains on a brilliant career.